First, the confession: I didn’t grow them, but I’m eating them like crazy. 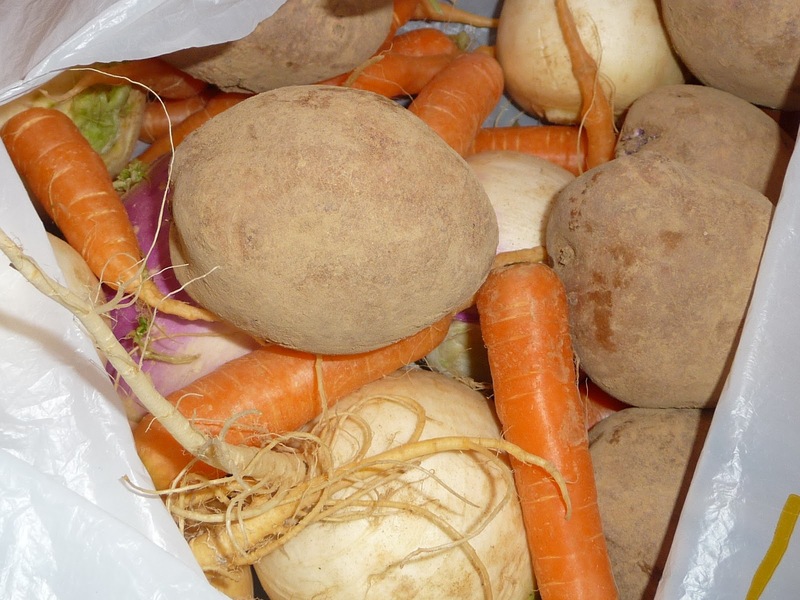 I get turnips (and carrots and more) from our friend, Theresa Mycek, the grower/manager of Colchester CSA, who lives just down the road and grows a fabulous selection of carrots, beets, turnips, and daikon radishes (and the proverbial more). 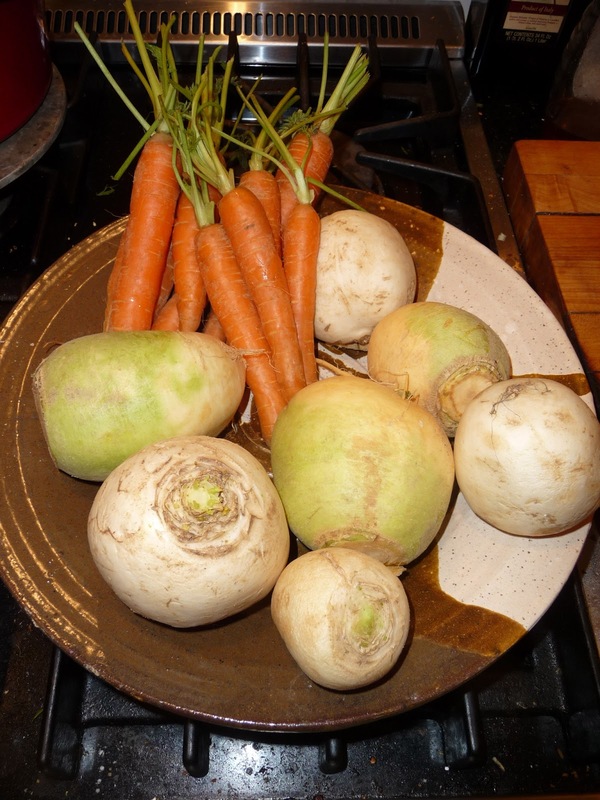 I’ve always loved vegetables, but I didn’t used to like turnips ONE BIT until I had some fresh from the ground – and not overcooked. Old, and overcooked they’re bitter and icky. Fresh and well cooked, they’re really good. Theresa grows three kinds of turnips – Purple Top, Hakurei, and Gold Ball. Purple Top, with pretty purple shoulders, is what we usually see in the grocery store. 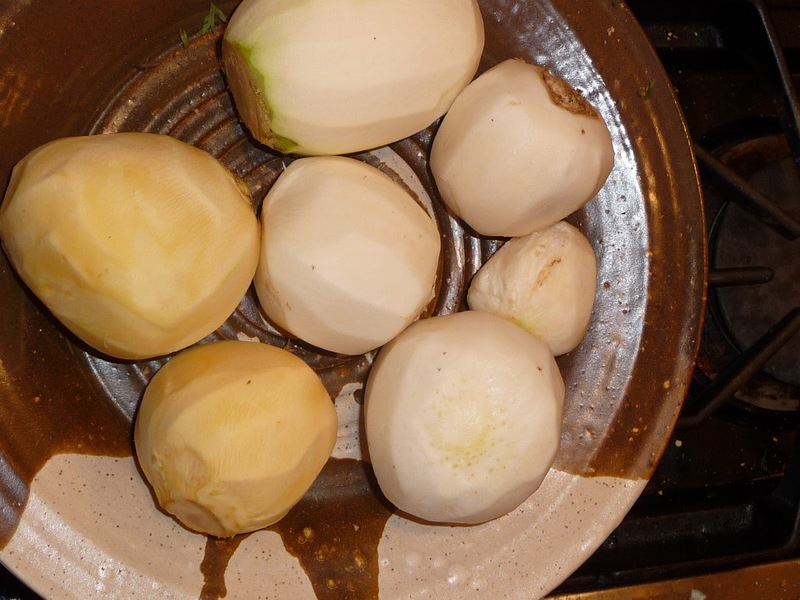 Hakurei is a white globe that’s crisp, and slightly juicier and milder than the purple top, so in addition to being good cooked, it’s nice cut up raw in a salad or shredded in coleslaw like a radish. Gold Ball turnips have creamy, pale yellow flesh and are sweeter than Purple Top, especially when roasted. Turnips (brassica rapa), which are relatively high in Vitamin C, are members of the same family as broccoli, kohlrabi (aka turnip cabbage), and rutabaga, (aka Swedish turnip or Swedes). The turnip itself is a large taproot, whose leaves are also edible. People over here on the Eastern Shore often stew the greens with bacon or ham and some onions or sauté the young leaves. 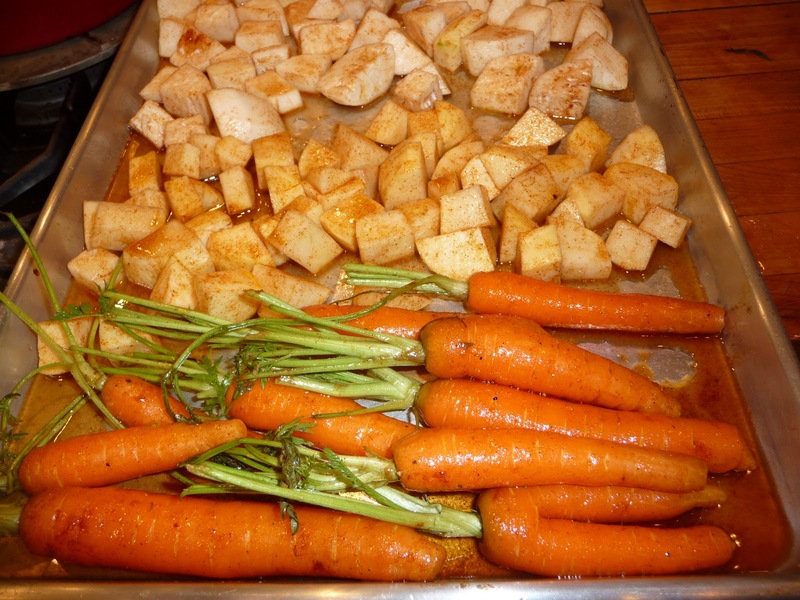 ← 2013: The Year of the Root Vegetable! They look delicious Nancy. Now all you have to do is substitute a leg of venison for the leg of lamb and you have a perfect HIEI (harvest it eat it) dinner. So far, I have not been a turnip fan. That is until I tried the Hakurei turnips. I was so suprised to find a turnip that is sweet (not spicy or pungent at all). It has become a regular addition to my salads! I am so happy I found yet another vegetable to grow for my winter garden. 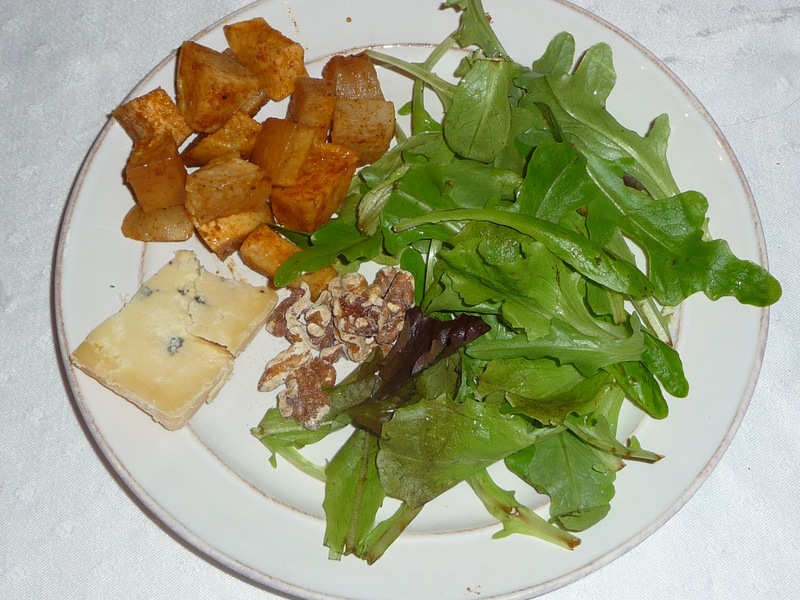 BTW, we are still eating from my garden, daily! Sabine, daily? Gosh. You've got it well in hand! I just canned my way through fall, and occasionally go out and clip a few straw herbs for salads and soups. My hat's off to you. I need to come down and see you garden, and chickens! Sorry it's taken me so long to respond, Kent, and in the end, negatively, since I don't particularly like venison. We get a fair amount over here, and while I eat a lot of wild critters (my husband hunts), venison, even venison stew, which I make occasionally using lemon pepper jelly instead of plum or currant jelly, just doesn't do it for me unless there's LOTS of red wine to wash it down with! But the lamb,ah, the lamb! We have for years bought from friends who raise sheep, so it's ALMOST am HIEI dinner.